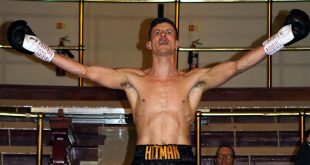 Last night, at the Municipal Hall in Colne, Lancashire, England, Steve Wood of VIP Promotions presented a night of professional boxing that featured seven contests. There was a packed and lively crowd inside the ornate surroundings of the ‘Muni’ and they were treated to some great action. Before fighting commenced though, the main fighters stood on the canvas and MC Michael Pass led a full one minute applause. Only a few days earlier, three young people from Colne were tragically killed in a car accident. The standing crowd clapped loudly in support of the people of Colne and the trio of friends who had tragically lost their lives. Warren notched up his second pro-win against experienced Jones. Warren scored with left and rights to the head of Jones, who found himself taking a count in round five but saw it out to the end of the fight. Debutant Jennings did well against tough veteran Carl Allen to secure his first pro-win on points, 40-37. 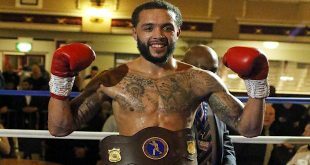 Local man ‘Singy’ will be delighted with his pro-debut. The debutant was all smiles when he entered the Muni to big crowd support. Using long reaching left and right shots to the head, Singleton forced his opponent to take the count in round five and was then stopped by Referee Steve Gray. Singleton wins by TKO round five. Popular Flanigan sustained a nick to the forehead early on but O’Gara had to take a count in round two. 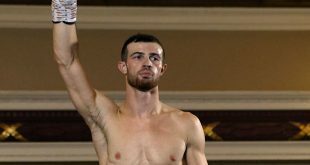 The Manchester boxer scored success with the right and despite a big last round effort from O’Gara, southpaw Flanigan secures the points, 40-35. Flanigan's record now stands at three wins ans no losses. O’Brien got off to a good start in round one but was in trouble in round two from a determined Warburton. Managing to regain his composure by the end of the round, O’Brien has a better round three and four. But just a few seconds before the closing bell in the fifth round, Warburton lands a right shot that rocks back the head of the Burnley man. It’s a close fought contest with both men scoring a draw, 57-57. 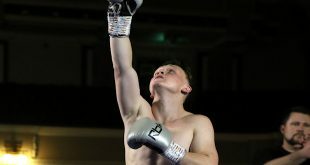 Popular McFadyen got off to a great start, dominating the first two rounds and keeping busy with body-shots and uppercuts. Razak hardly threw a shot until round three when he did have McFadyen under pressure momentarily - but Razak ‘stood off’ allowing him time to recover. 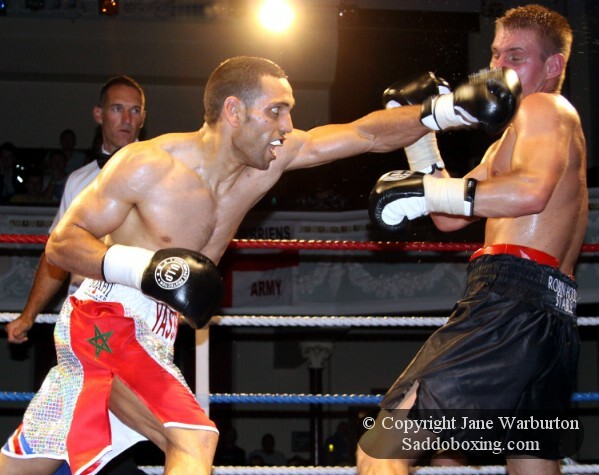 Razak ‘woke-up’ again in round four to put McFadyen under pressure again briefly, but McFadyen had had a consistent work-rate during the four rounder and ‘The Burnley Banger’ secured the points win. 40-37. McFadyen improves to 12 wins (1 by KO), 1 loss (1 by KO) and 1 draw. He now goes on to fight for the English bantamweight title in October. The last contest of the night was between Morrocan born El Maachi, ‘The Showman’, and Latvian born Spitko, ‘The Pitbull’. 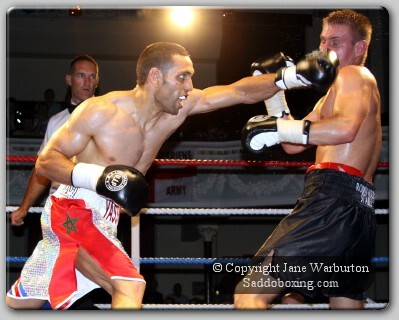 El Maachi improves to 9 wins (3 by KO) and 4 losses (2 by KO). Lastly, Referee Steve Gray was visibly relieved when the bell ended the last fight of the night. Having refereed all seven contests, he did wonder if it was something of a ‘record’! Next European Boxing News: Tomasz Adamek vs. Andrew Golota In October?